Expectations were high after talking with a couple of “regulars” in the parking lot at Island Hills, prior to our review in early August. We had made the trip from Grand Rapids to the River Country (a little over an hour and a half drive) to play what up to this point is our southern-most round of golf in our great golfing state of Michigan. Centreville is located just east of Three Rivers, a small community south of Kalamazoo, and about 10 minutes off US 131. 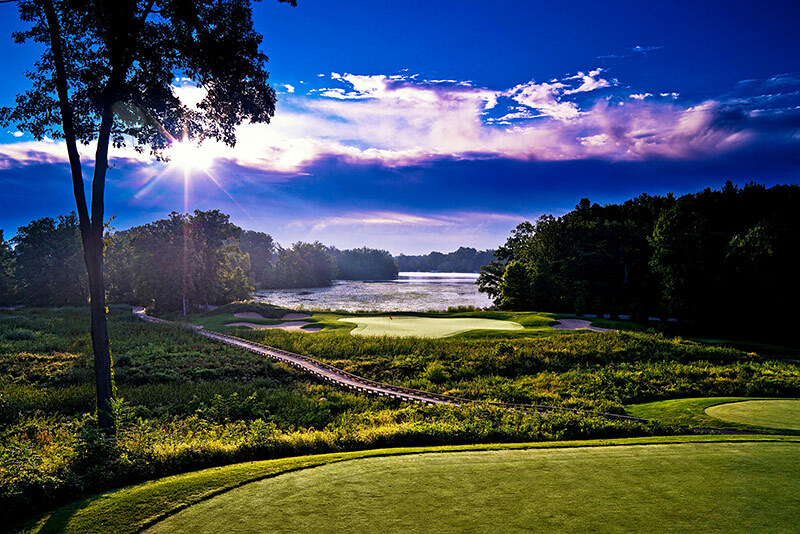 “River Country’s” landscape is graced with a number of golf courses – with Island Hills topping the charts as the best in Southern Michigan. 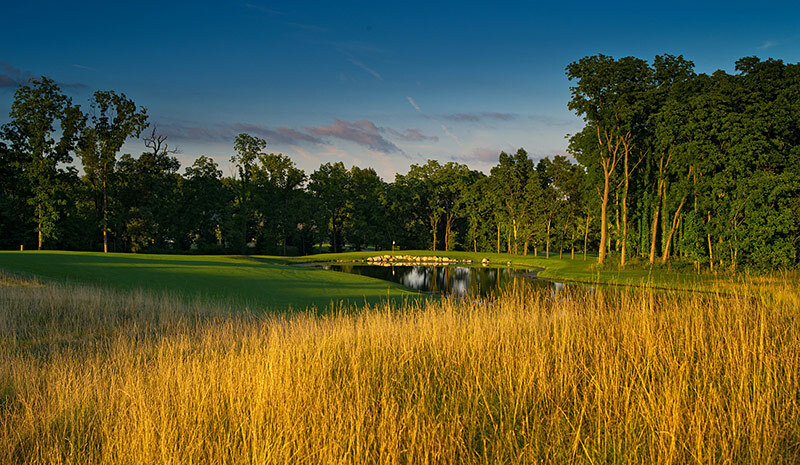 It has been selected as one of the top five public courses in the state by Golf Digest, and the five finishing holes have been recognized as the “five best finishing holes east of the Mississippi” (Michael Stewart – Golf Chicago). Craig Brass of the Michigan Publinxer Golf Magazine covers the gambit when he says Island Hills is ” a shot maker’s course, a purist’s course, a lady’s course, a gambler’s course, a senior’s course, a medal or match play course, and an amateur’s or professional’s course”. Ok, we get the point ! Newly constructed “state’of the art” villas have been constructed and these 4 and 5 bedroom units are amongst the nicest lodging that you will find in the area. For more information and to make reservations, visit the Island Hills website by clicking on the link at the top of this review. 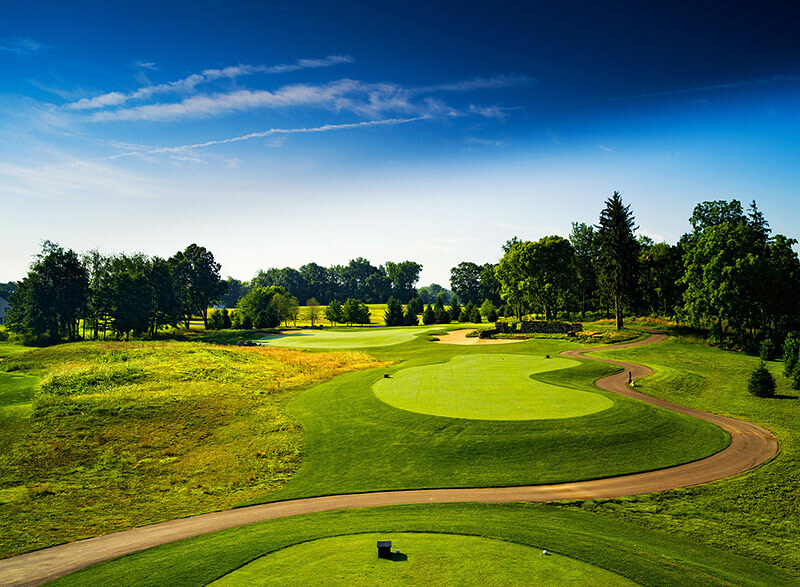 After playing exceptional layouts all over Michigan, including St. Ives, Pilgrim’s Run, Quail Ridge and Thornapple Pointe in the Grand Rapids area – we needed to be impressed. Golfers living in our state certainly are blessed, with such a wide variety of courses to play. We find that each course has defining characteristics – whether it is difficulty vs. playability, exquisite or rustic conditioning, tight or generous fairways, puttable or challenging greens, or simple or upscale amenities. Some characteristics may be constant throughout the layout, or may be unique to contrasting nines. At Island Hills, the overwhelming draw is indeed the 4-hole sequence at the end of the round. If you come here to experience something exceptional, be patient – it will happen.! We wholeheartedly agree with the assessment of past visitors – the finish here is something special, featuring some of the most spectacular water holes in the Midwest. Island Hills is a Raymond Hearn design, with 6 tee boxes measuring between 2946 yards for juniors and 7074 yards from the tips. The first 13 holes play over a variety of terrain, with a nice mix of parkland, tree lined fairways, and open links style holes. There is a good variety of straight and bending design shapes, creating ample risk/reward opportunities . With slope ratings varying from 117 to 135 – this is a course that can be enjoyed by all levels of golfers. Land on the mostly generous fairways, and you often will find even lies and good par/birdie opportunities. The opening hole is an open, links style hole with water left off the tee and high fescue on both sides on the approach. It is a low handicap and a very reasonable starting hole. Pay attention to the pin placement, as this green is quite deep. The second par four plays long, and features a carry of 150 + yards over a marsh off the tee. You must favor the right side of the fairway to reach in regulation. There is bail out room right on the par three 3rd, which also demands a carry over wetlands. The par five 4th has a generous fairway but narrows on the second shot. Two accurate shots will put you in position for an easy downhill wedge or short iron. Number five is a simple par three, with the green sloped (as are many of the putting surfaces on the initial nine) from back to front. Two lay up shots will leave an easy approach and good birdie opportunity on the par five 6th. Long hitters may gamble and reach in two. A huge fairway bunker runs across the fairway about 140 yards out. A fairway trap in the center, about 190 from the green is the lone obstacle to a good score on number seven. From here on in, the holes seem to take on a different, more mature look, with finely sculpted tee boxes, fairways and putting complexes. The eighth features a very tight, tree-lined fairway. The right side is the place to be here. A narrow dogleg left par four is next. The approach is to green that is tucked between a host of mounds, with some interesting pin placements. Par is a great score, considering the accurate approach necessary to reach in regulation. A quick stop at the clubhouse at the turn is a convenient option. Sandwiches, snacks and beverages are available, with their gorgeous patio affording nice views of the practice green and golf course. The banquet and outing facilities at Island Hills can accommodate groups of all sizes, from an intimate event to outings of over 300 people. Initially, we must admit that we did not understand all the hullabaloo about the layout. While nice, the initial 14 holes are not unlike many of the other nice layouts in Southwest Michigan. Enjoyable and interesting for sure – but nothing too much out of the ordinary. The conditioning, (especially the putting surfaces) was very good, and the practice facilities include a nice grass range with target greens and a practice green for putting and chipping. The clubhouse is certainly upscale, with a nice pro shop and dining options for lunch and dinner. 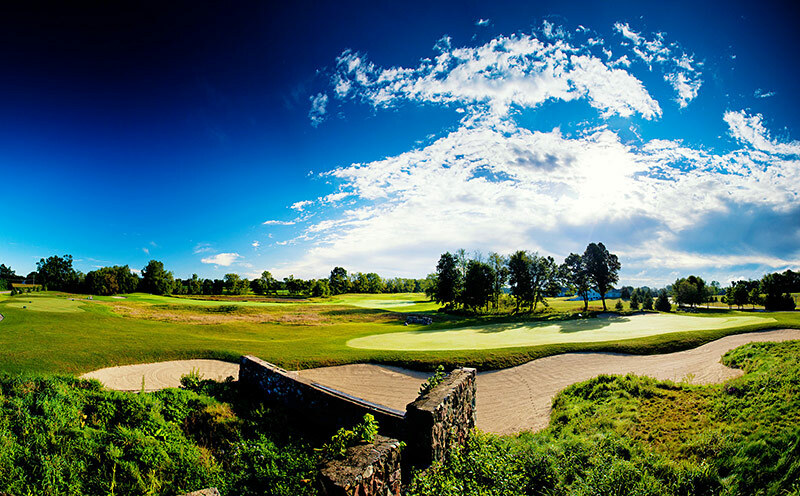 The last four holes will make any golfer take notice, however. Frankly – the memory of these holes stands out still…Most top courses have strong finishes, and a group of 2 or 3 holes that really stand out. Island Hills has five – and I can remember every shot on each of the four holes. The experience is worth the drive. 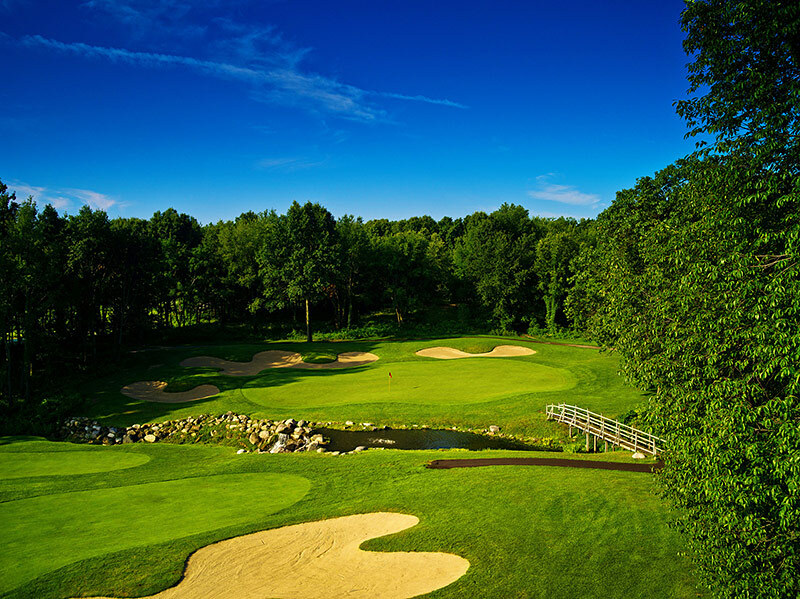 If you are anywhere near Kalamazoo (Island Hills is just 30-40 minutes from Gull Lake View Resort), it will be well worth your time to schedule a tee time here.